Benita was a client who knew exactly what she wanted on her site and how she wanted it to look. With a logo created by an outside graphic designer, Web Medicine Woman incorporated the logo into a website header featuring one of the headshots we did for Benita. The header design is also used in the MailChimp campaign sent each month. We worked closely to find a way to fit her content into pages that were simple for baby boomers and elders to navigate. I created additional graphics for the free offer with optin, as well as designing a MailChimp-based newsletter format. Each month Benita sends a newsletter with a featured article, current happenings within her community, a recipe, trivia questions, and a unique commentary from her office assistant, Chester. 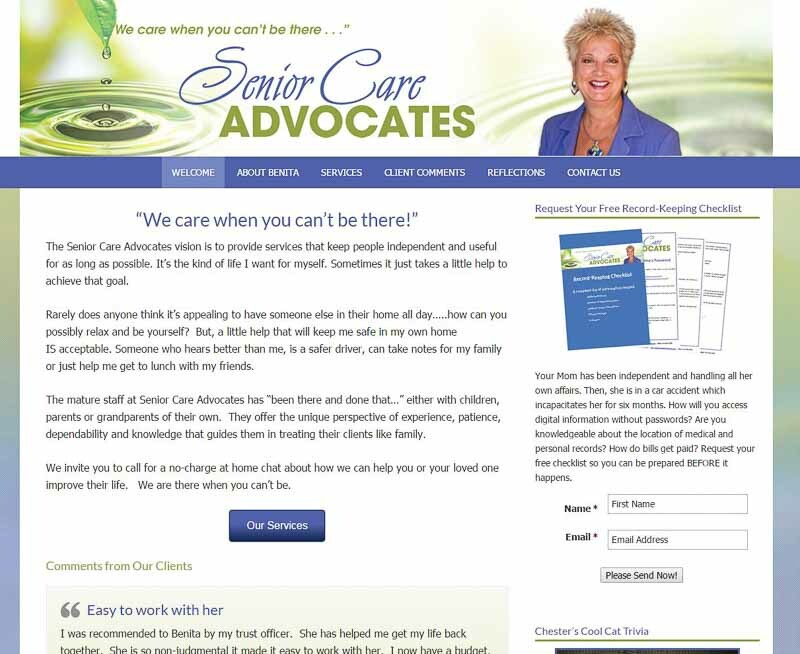 Some of the content is also posted to the Senior Care Advocates website and shared via Facebook. Benita has contracted with Web Medicine Woman for site hosting and our annual maintenance package. We also produce her monthly newsletter and blog posts.